Lose weight while walking on the boardwalk and having fun is my inspiration of the day. 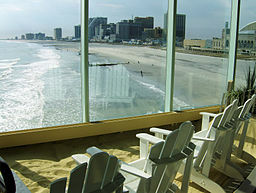 When I visited Atlantic City, NJ in the summer of 2016, I decided that I was not going to gamble in the casino. Maybe I would use some of the “free” money that the casino gives you as a new visitor where you can play in the “penny” machines, but I am well aware that the house always wins. Before I went to play, I went for a walk on the boardwalk. It was a cloudy day. The weather channel had predicted rain, so I packed my oversize size S raincoat into my purse. I walked in the direction to all the other casinos. The bus had stopped in the last resort on the boardwalk. It was easy to find the entrance to the boardwalk. There was a large door to the boardwalk that I found after doing a little exploring. I had to go down a level and turn to the left from where the bus stopped. It was not raining yet, but the sky was grey and the darker clouds were coming closer. I walked for a half hour and I saw a wooden path to the beach. I went to see how the beach looked. There were few people on the beach, probably due to the weather, and I took a glance at the horizon. The wind was dancing with the waves as if preparing for the rain to come down any minute. I went back to the boardwalk and it began to drizzle. The rain combined with the wind was not a fun sensation. I wore my raincoat and felt better. I was feeling hungry. I had eaten one boiled egg and drank a glass of tea for breakfast many hours before. I remembered that I had some crackers from the bus. The trip included a snack breakfast and I had drank a small box of orange juice on the road. -“If I had cheese with this crackers that would be the perfect snack”, I thought while I was looking for the packs of crackers inside my purse. I found it and opened the plastic wrap with a quick pull from my hands. I took one of my crackers. I looked at it and to my surprise the snack was crackers and cheese!! I felt so happy!! the day was perfect. Crackers and cheese with a walk on the boardwalk. There is no better combination. What else could I ask for? There were four cracker and cheese sandwiches. I ate the crackers slowly, tasting every bite and feeling great. After a few minutes of walking in the drizzling rain, I saw a casino that looked like a palace from “One Thousand And One Nights” with a golden dome. I went up the stairs and walked through the arched doors. The floor had Persian rugs lining the whole room with golden columns placed the inside by the walls. I was impressed by the luxury, but I did not see too many people. I decided to continue my journey on the boardwalk to eat lunch. I went back the stairs and looked back at the palace from a distance. There was a mall in a casino half a mile away and I decided I was feeling hungry again. The snack I had before had already been digested in my stomach. I went inside the mall and took the escalator to the third floor following a sign that lead me to a small food court. The food looked delicious! I bought grilled chicken, vegetable stew on top of greens, a small salad, and a bottle of water. I ate my food slowly and enjoyed the view of the ocean through the glass walls that were placed all around the third floor. After I finished eating, I went back to the casino and walked more in the mall inside the casino. There were colorful stores all around and the walls had beautiful paintings inside of golden frames. I ran into some people from the bus and had a small talk with the group. We then went to play on the Penney machines. I did not win anything, but it was interesting. I had a great time. I loved the walk, the food, the scenery and architecture of the buildings and the company. 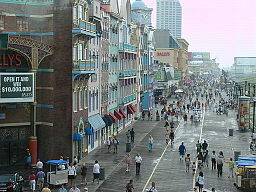 I went to Atlantic City and enjoyed two hours of walk on the boardwalk. 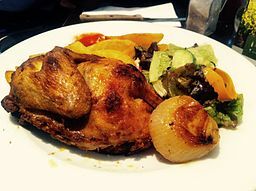 I ate lunch on the mall, Grilled Chicken with vegetable Stew and greens salad. I drank two bottles of water. I loved the architecture of the casinos, I played a little and did not win anything but I had a great time.